Worrying about how you're going to keep your home up and running when the lights go out is no worry with Cummins QuietConnect™ Generators. Residential customers love these air-cooled units, because they're some of the quietest generators in the industry. That's a plus when your entire street is blacked out due to severe weather, a curious squirrel invading a substation or a grid-locked homeland security incident. These air-cooled generators are lighter and more affordable than larger liquid-cooled generators. They are easily and professionally installed so that homeowners are safe and not inconvenienced. What is convenient is that the QuietConnect™ series comes with remote internet monitoring free of charge with no monthly fees. The mobile app makes managing your unit quick and easy no matter what the season. Cummins QuietConnect™ series runs on clean-burning, environmentally friendly propane or natural gas. Their smaller, fuel efficient engines use less fuel--a huge bonus for extended winters. 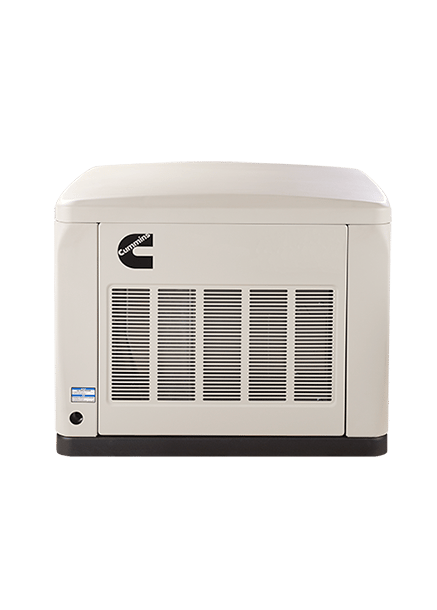 Cummins QuietConnect™ generators have advanced enclosures to protect your unit and come with cold weather starting kits rated to zero degrees F so you and your family won't be left out in the cold. Cummins, headquartered in Columbus, Indiana, will be celebrating a century serving businesses and families all over the world. Their aesthetically appealing QuietConnect™ series will generate more than light, they'll generate the knowledge and confidence that your electricity will be back on in seconds and that your family is safe--which makes all the difference in the world.